After a break from the EDM scene, Peter Kriek and Ariaan Olieroock aka 16 Bit Lolitas, make their return with a brand new album, released on June 22nd through their own Bits & Pieces label. 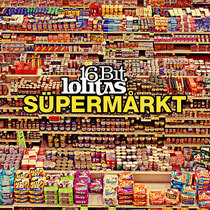 'SUPERMARKT' is a 73-minute journey that features 11 original tracks and a 16 Bit Lolitas remix of UNKLE’s ‘Money And Run’ (feat. Nick Cave). Working together since 2004, and known for emotional, patiently crafted tracks such as ‘Murder Weapon’, ‘The Puppet Show’, ‘Sedna’ and ‘Nobody Seems To Care’, 16 Bit Lolitas now reveal their new long-player. And, despite their ability to move along with the sound of time, really the best thing about ‘SUPERMARKT' is the fact that they always stays true to their roots. With the mission to bring music that stimulates the body, the brain and the soul, the album is deeper and darker than 16 Bit Lolitas’ last album, the Warung compilation. 16 BL: ”Trying to move with the times is like walking a tight-rope during an earthquake sometimes. In the end, whenever we’re in the process of making an album, we always go back to just making some music we like. And this time, unsurprisingly, it is no different. The underground scene has changed a lot, yet some aspects of it will never change. We try to move with the time, but never away from ourselves. So after a long pilgrimage we've arrived at a sound that is new, but still very much 16BL. ”We try to stay connected but also unconnected at the same time. The most important thing in the end is that we follow our hearts musically and create music we feel strongly about. This has always been at the core of 16 Bit Lolitas. Not so much to fit into a style or genre but just to make underground music that moves us. With this album we're moving forward and also backward at the same time."